It is spring. I have been busy cleaning house and chasing my little birds. We finally ventured outside for some yard work and the experience was inspiring. Raking leaves is a chore of mine that I thoroughly enjoy. It's funny that I procrastinate getting around to it, but when I finally dive into the monotonous rhythm, I quickly am entranced and find myself in a meditation. This time, while scraping away the leaves from the flower beds, I had a daydream. I imagined that the sensation for the earth was like a hair wash after a long camping trip-- one tends to spend a little extra time in the shower scrubbing and scratching the scalp, or at least I do. You know the satisfaction in the eyes of a dog when you're scratching its belly? I imagine after a long winter, the soil appreciates the scratch, rub, and fresh oxygen grazing over the new growth finally exposed to light. As much as it is pleasurable for the earth, it also brings me intense satisfaction. The delicious aroma of tierra and herbs is utterly energizing. I spent a little extra time combing the sleeping mint exposing its buds and perfume. Ugh..... perfection at its best! It has been a long winter. If only I had all day in the sun. Eventually, my boys got bored with my work and we moved to a more exciting spring project, feeding the birds. A trip to the market, a wagon, and several pounds of bird seed later, we all had our fill. We also recently went to the city for my eldest son's (Timo) spring break. Every time I make it into the city, I always try to go to a yoga class, get some sort of asian meal (which usually includes a soup and dumplings ), and stop by Whole Foods. It's very exciting for me to go to a store where there is virtually every health food product on the market. Especially when you live in the country. Yet, I usually only purchase a granola bar (W.F. bakery) and a kombucha. After my yoga and Whole Foods trip, I met up with the boys again, and we enjoyed the circus. I busted out my granola bar and Timo turned to me (amidst the cotton candy) and asked if I could make him a bar like that at home. My kid does not have to ask me twice.. It's not easy to make the perfect chewy granola bar. Or rather, it's not easy to make the perfect "healthy" chewy granola bar. I made many rounds of granola bars to come to this temporary conclusion. I hope you enjoy it. It is not exactly how I imagined, but delicious regardless. More importantly, it passed the taste test. The bird is happy. 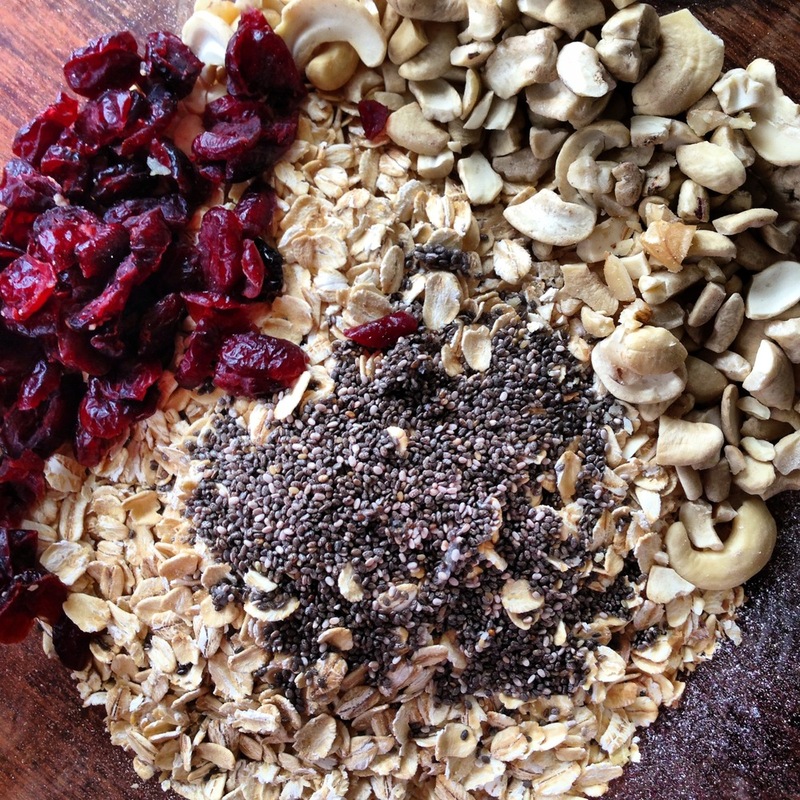 To make the granola bar, you add all the dry ingredients together. You can substitute any of the nuts and seeds with whatever you like. Some people like to add chocolate chips. Also, I used instant oats instead of flour as a filler. If you think you might enjoy a more "cakey" granola bar, you can substitute whole wheat, spelt, or all-purpose flour for the instant oats. You do need the 2 cups of rolled oats though...so don't substitue that. In a separate bowl whip the egg whitesIn another bowl mix all the wet ingredients well. You may substitue butter instead of the coconut oil. I persnoally enjoy the decadant richness, health benefits, and flavor of coconut oil. Do you prefer almond butter over peanut butter? I found peanut butter was the seller for Timo, so peanut butter it was. Stir in the egg whites into the wet ingredients. Mix well. Use the back of a spoon to smooth any lumps against the side if the bowl. mix wet and dry ingredients in separate bowls and the combine. Smooth into the parchment lined pan, and bake for 30-40 minutes. Check for firmness in the middle and golden brown around edges. Enjoy!